Strawbazies: The Chronicles of Ishaan and Amaani: 'Okno Mama Californ-eye-ay! My baby brother moved this week It's a big move! He'll be in an exciting new city (San Fransisco) starting an exciting new job. I'm 8 years older than Ronak so my relationship with him is a mix of parent and sister. 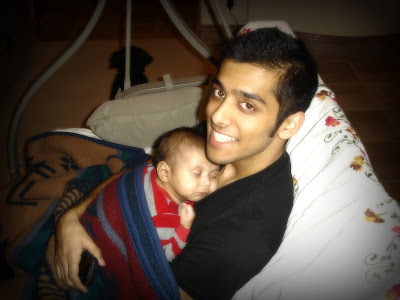 Please don't get me wrong-- I am no where near like a mom to Ronak; but he was the first little taste of parenting for me. And I feel some pride in his accomplishments and love to see him excel. My mom was asking me about defining characteristics of my brother this evening... So many things ran through my mind... So many accomplishments; so many times when my heart's swelled with pride-- playing the triangle at the Myerson, being 4th in his graduating class, getting into Wharton... but I don't think any of those things particularly define him. Compassion. Compassion is what defines him. One of my favorite memories of him was when we were visiting the Taj Mahal. I remember looking for him exasperated; turning around and scanning the crowded garden. I looked up, and I realized that he was helping 3 men carry an old lady in a wheel chair down the steps of the entrance. I remember thinking how grownup he looked in that moment. I started writing this post a few minutes after Ronak left my home. He gave me a huge hug and I watched him walk down our not-so-green lawn into the van. It was surprisingly difficult to see him walk away. You feel a tug at the heart like the tug you feel when your kite is cut free from the string (or your brother's unruly dog slips his collar). One moment you feel the tension on the string, and in the next-- nothing. It's not painful exactly-- not even upsetting; but a mixture of happiness for his new independence and longing for closeness. Roni, we wish the best for you and are so very proud of you and we love you so very, very much. best post ever!!! ronak we are so proud of you and miss you so much... everytime ishu sees me he asks for you!!! Miss you ronak. Hope you are having fun in SF. Wish I can post soccer tournament story like this.